If you love cakes, it's worth visiting the hill town of Darjeeling for a piece of cake made by the Cake Lady. No jokes. You need to taste a piece of mouthwatering cake in order to believe it. So who is Cake Lady of Darjeeling? 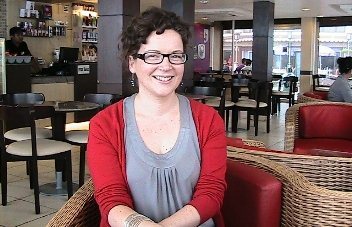 She is a New Zealander who has taken up Darjeeling as her present residence because she just loves the place and the people. And what's her name? She told me her real name as we sipped a cup of coffee at the Mall CCD, but she prefers to be called Helly, the way she is known to her friends. She has been fascinated about India since her younger days. At the age of 14 when she worked in a Cafe in New Zealand, an old lady once walked in and asked her for a cup of Darjeeling tea. She knew nothing about it then. The next day the old lady brought some packaged Darjeeling tea and asked Helly to prepare a cup of tea. The old lady also brought with her few pictures of Darjeeling. Helly's fancy for Darjeeling started since that day. She subsequently worked in various countries. Her last job before coming to India was in Sydney where she worked for three years in a business that dealt with the Sydney Tower. After three years it was time for her to travel again. With her friends from Sydney, she traveled for the next one year across countries like Thailand, Vietnam and others. Later she came to India and visited Delhi and Rajasthan. And finally she arrived at her fancy land, Darjeeling. Initially she lived out of her savings and did some voluntary community work. With time, she decided that she would make her new home in Darjeeling and started thinking about a livelihood. After many of her local friends and neighbors suggested that she should consider making cakes, one day she finally made up her mind to do so. Her previous background of working in restaurants and knowing great cake recipes helped in the matter. Soon she went to New Zealand and brought back with her an oven and accessories for making cakes. Her parents still live in New Zealand who she visits once a year. During the initial days in Darjeeling, she used to hand deliver the cakes herself to homes and shops from where she would receive the orders. Soon she realized the need to advertise and distributed flyers and small posters at the local shops, restaurants and hotels having her offerings and contacts. Over time the business started expanding, and now she has staff who deliver the cakes. Initially the cakes were delivered in plain white boxes. Now the boxes have colorful prints with her logo on it. She is now a very busy lady and tries not to work on Sundays. But sometimes the birthday orders from local families keep her busy even on a Sunday. She lives in a nice rented apartment down the Zakir Hussain Road that goes out from the Mall. So what kind of cakes can you get from the Cake Lady? Deluxe Chocolate Cake with double chocolate icing. Carrot Chai Cake with thick butter cream. Banana and Cashew Cake with dark chocolate glaze. Mocha Cake combining chocolate and coffee with rich mocha icing. She also makes Cake of the Day that can be from 1 pound to 4 pounds. Apart from these, the Cake Lady also makes Chocolate Brownies, Raisin Load, Coconut Chocccy Chews etc. The muffins come in different types and flavors like banana & chocolate, lemon & coconut, carrot ginger & raisins, savory with cheese and roast veges, etc. Where will you get the cakes? 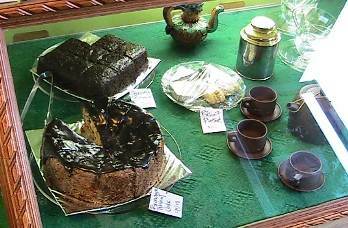 While in Darjeeling, you can call up Helly and directly order for the cakes. She will get them delivered to your hotel. Her cell no. is 95474 57734. If you are looking to taste just a piece, you will get them in Golden Tips in Chowrasta Mall and the Hot Pizza Place which is just 5 minutes walk from Chowrasta. Update April 2014: Helly is no longer baking cakes.